Timothy Keller shows us the flawed heroes of Judges—and how they point us to the flawless hero, Jesus. This six-study guide by Timothy Keller will show users how this dark, difficult period of history points us to the wonderful message of the gospel. Judges takes us to a time of murder and massacre, immorality and unfaithfulness. But it also reveals to us the God of mercy and long-suffering, who rescues his people time and again. And it points us to his greatest rescue, through Jesus Christ. 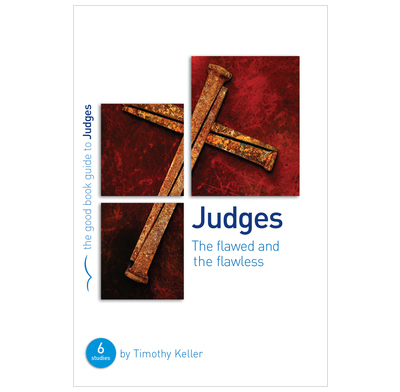 The flawed and the flawless is designed to work alongside Judges For You, Timothy Keller's expository guide to Judges. His clarify and insight will help anyone exploring this challenging, yet thrilling, Old Testament book. The Good Book Guides are easily the most consistently faithful and helpful small group workbooks. A study book by the much acclaimed theologian Timothy Keller could not fail to please; and this is one of the hardest biblical books to find favour with readers. We used it for a church bible study, and found it condensed easily into 30 min. I took the second, and probably the hardest study, but Keller helped enormously. We should not be afraid of these “difficult” books, but regard them as a challenge. Thank you Timothy Keller for helping with that challenge. I was not looking forward to studying Judges in the small group but went with the flow. It is quite hard work with a lot of reading. However, it was very good to be reminded of the various Judges and how they were used by the Lord at a time when God's people constantly turned their back on Him. It was very challenging to realise just how pertinent that is to our lives today as we often continue to go our own way. But a reminder of God's love for His people and His ability to forgive as we allow Him to lead us. In the light of the current situation in Iraq and Syria these studies have raised a number of questions about obedience to (a) God. We have also discerned that in Western society today there are many similarities to the Israelites of the Judges period in history. We have taken two weeks over each study. This a great outline for a small group. With a little imagination it was able to relate that history to todays problems. The relating and discussions were lively and in the end there was a greater understanding of what and why things happened the way they back then. This study so inspired discussions that we were only able to cover two or three items in a meeting. Our group took about three weeks for each session in the book. Why study Judges? It makes that history relevant to todays problems in society.